It’s a dangerous world, and sometimes bad guys threaten our safety, our lives. The Second Amendment to the Constitution was drafted with this permanent reality in mind, granting the private citizen the legal, basic right to protect oneself. With guns if necessary. And if that right is rescinded, who ya gonna call when the bad guys come? Not Ghost Busters and most certainly not arrogant police Sheriffs like Scott Israel who actively supports the Obama/Clinton agenda of gun control/confiscation. With equal fervor, he opposes anyone like NRA members who want to retain their basic right to self-protection. Transformation has come to local law enforcement. Characterized in years past as a “colorful character” in Broward County, FLA, Israel boasts a history of seamy liberal Dem political alliances right up thru the present. As with virtually all the wonders of ProgObamaism, there are deadly consequences which, alongside the lofty intentions of the Left, don’t seem to matter. Flying in the face of all logic, Broward School Superintendent Robert Runcie has imported the Chicago Way in public education, claiming that children of color have been disproportionately singled out for bad behavior in schools. Voila! The PROMISE program: less discipline, fewer suspensions, zero accountability for bad behavior. And illogical, doctored results claiming vastly improved behavior! Verifiable on Mars, perhaps. If ever there was fake news, this is it. Following the money, the award for implementing such crazy policy has yielded million$ in Federal aid to Broward County or any cooperative recipient, greenlighted from the highest levels of the DOJ. A totally subversive, racially-charged PC policy of less discipline and monitoring of troubled kids by educators=more money from the Fed. What’s not to like? So, why the surprise when a widely reported time bomb like the killer Cruz morphs unimpeded from troubled teen to mass murderer? 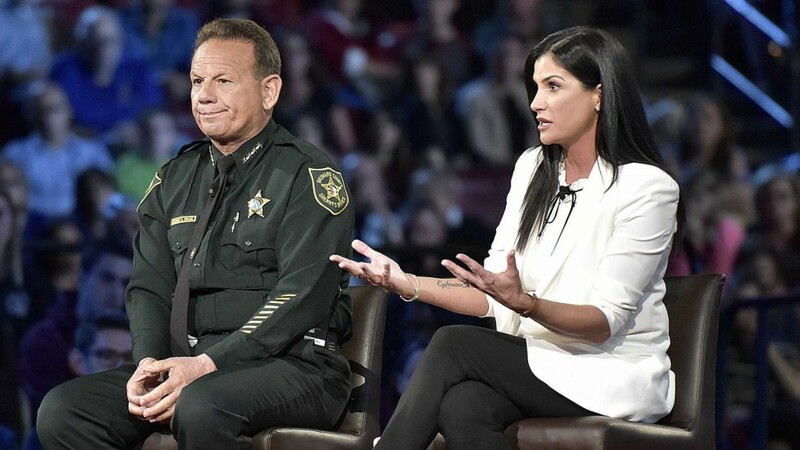 And why the shock when policemen under the command of a stalwart Dem political stooge like Scott Israel stand down and…just stand there outside while, inside, a massacre ensues. Only 39 warnings about Cruz to various authorities and no restraining action, no investigation. What, me worry? Like everything connected with Obamaic Transformation and the blessedly aborted Clinton Continuation, such “Progressive” policy runs counter to all our American liberties. 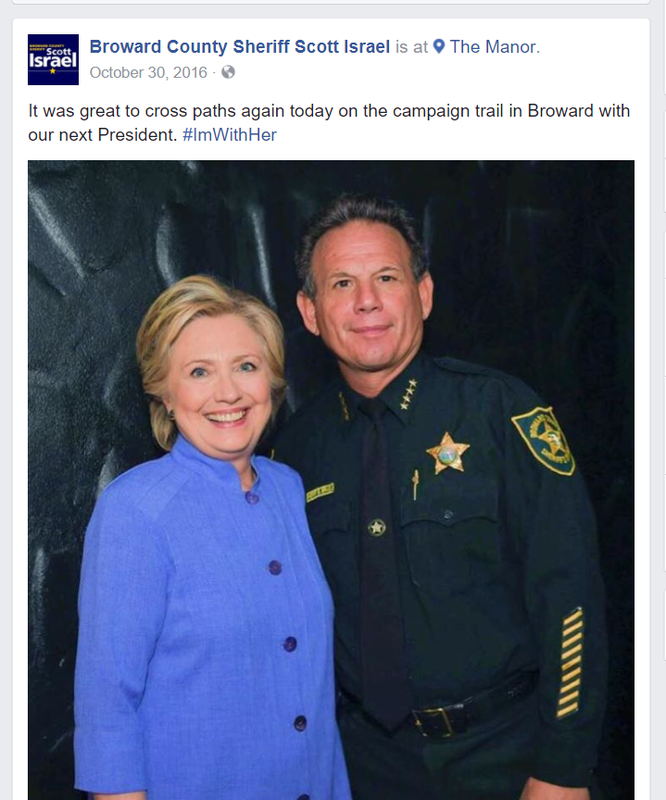 If David Hogg is the ugly face and consequence of Progressive propaganda in our public schools, Scott Israel is the embodiment of it in local law enforcement. When infected and guided entirely by the Leftist politics of manufactured chaos followed by the inevitable centralized crackdown on a disarmed citizenry, even the once-trustworthy Man In Blue gives off that scary Red glow that kills.